A U.S. Navy SEAL was killed in Northern Iraq Tuesday by direct fire from ISIS forces that penetrated several miles across Kurdish lines. A statement from Arizona Governor Doug Ducey identified the slain service member as Charlie Keating. "Our state and nation are in mourning today over the loss of a U.S. serviceman -- and one of America's finest. Navy SEAL Charlie Keating, a graduate of Arcadia High School in Phoenix, was killed this morning in an ISIS attack" in Iraq, said Ducey's statement, which ordered all state flags in Arizona to be lowered to half staff on Wednesday and the day of his interment. "Our thoughts, prayers and eternal gratitude are with Charlie Keating, his family, his fellow SEALs, and all of the brave Americans who've answered the call to serve." ABC News Phoenix affiliate KNXV reports that Keating graduated from Arcadia High School in 2004 and is the grandson of the late Arizona businessman Charles Keating and a cousin of Olympic swimmer Gary Hall Jr.
Keating was a champion long-distance runner at Arcadia High School and then attended the U.S. Naval Academy at Annapolis, Maryland before becoming a Navy SEAL based out of Coronado, California, according to KNXV. 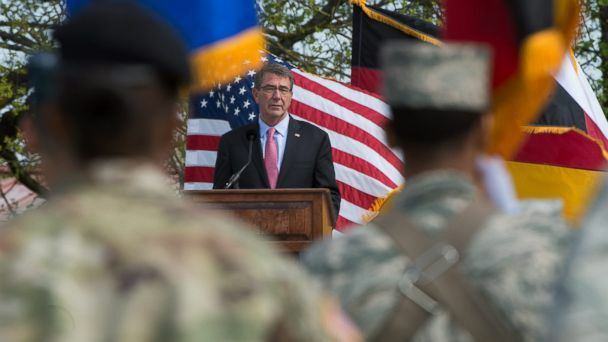 The announcement of the third U.S. death in combat against ISIS was made by Defense Secretary Ash Carter, who was in Stuttgart, Germany, to attend the change-of-command ceremony at U.S. European Command. "I'm getting reports a U.S. service member has been killed in Iraq," Carter said. "Our thoughts and prayers are with that service member's family." Carter highlighted the combat risks the roughly 5,000 U.S. troops in Iraq still face even though they are officially in a training, advise and assist mission. "It shows you it's a serious fight that we have to wage in Iraq," he said. A U.S. defense official confirmed to ABC News that around 9:30 a.m. local time ISIS forces penetrated the Kurdish Peshmerga front lines near Irbil. "This morning a U.S. servicemember advising and assisting Peshmerga forces was killed by enemy fire north of Mosul," Pentagon spokesman Peter Cook said in a statement. "The casualty occurred during an ISIL attack on a Peshmerga position approximately three to five kilometers behind the forward line of troops." A defense official told ABC News that ISIS used truck bombs to break through Peshmerga lines located about 17 miles north of the ISIS-held city of Mosul. The serviceman was killed by ISIS "direct fire" after ISIS forces pushed to his position. There were no other U.S. casualties in the incident. In line with his advise-and-assist duties with Kurdish forces, the service member was located away from the front lines. The official said the ISIS attack was repelled by 23 airstrikes carried out by F-15, F-16, A-10 jets and drones that had been called in to support the coalition and Kurdish forces. It is unclear how many Peshmerga casualties resulted from the incident. This is the third U.S. combat-hostile fire death in Iraq since U.S. forces returned in June 2014. There have been 13 non-hostile deaths in Iraq and in the region associated with the anti-ISIS mission. In late March, Marine Staff Sgt. Louis F. Cardin, 27, was killed by ISIS rocket fire on his artillery support base near Makhmour in northern Iraq. Last October, Army Master Sgt. Josh Wheeler, 39, was killed in a raid in northern Iraq that rescued 70 Iraqi hostages taken by ISIS. Wheeler, a member of the elite Delta Force, was advising and assisting Kurdish forces that launched the raid and was caught in the crossfire that ensued after his team helped repel heavy ISIS fire.